Tabbouleh, crispy chickpeas, and topped with housemade falafel and a tahini dressing. Creamy hummus, and Baba Ghanoush layered with organic spinach, quinoa Tabbouleh, crispy chickpeas, and topped with housemade falafel and a tahini dressing. Seasonal Bibb lettuce, watermelon radish, sliced fennel bulb, kidney beans, and juicy cherry tomatoes served with a champagne vinaigrette. House roasted BBQ turkey sandwich topped with a creamy red cabbage and brussels sprout slaw, cheddar cheese, and pickled zucchini. Tender roasted bell pepper and portabella mushroom with spinach and shredded carrots on Canyon Bakehouse gluten free bread. Topped with a wasabi aioli – veggie perfection. A Texas-sized bowl of tri-color quinoa, grilled corn, black beans, guacamole, crispy Romaine, Creme Fraiche, with a cilantro lime dressing and seasoned chicken. Brown rice pasta with a decadent goat cheese + truffle oil cream sauce and topped with crispy bacon. Served in a heatable jar. Pickled beets, carrots, tri-color quinoa, roasted sweet potatoes, seasoned chickpeas, and toasted pumpkin seeds topped with Mesclun greens. Turmeric, maple, tahini dressing. Glow from the inside out! Lavender + Honey + Chicken. Celery + Grapes + Pecans. Married together with a creamy dressing and topped with organic greens that go on for days. Dessert for breakfast? Our signature overnight oats with shredded carrots, cinnamon, ginger, nutmeg, and coconut flakes soaked in almond milk. Topped off with a carrot cake crumble and whipped cream cheese icing. Scratch-made paleo crust filled with an organic strawberry and blueberry compote. Local White Mountain Greek yogurt with an organic strawberry and blueberry compote. 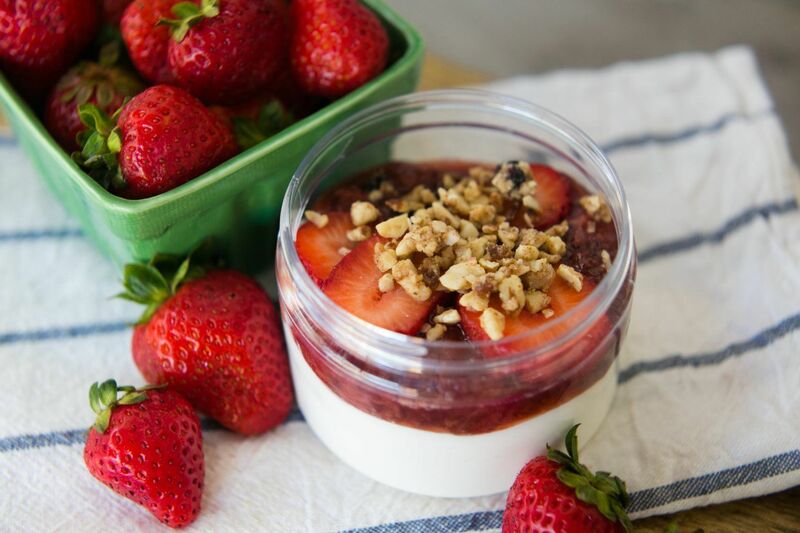 Served with our signature grain-free granola. Flaky Paleo crust filled with cave-aged cheddar, local Mill-King milk, and cage free eggs with chives and bell pepper. NOW in a heatable jar! Fluffy cage free scrambled eggs with sautéed onions and red cabbage + roasted breakfast potatoes. All topped off with a maple mustard sauce in a heatable jar. Cheddar cheese. Why? Because cheddar makes everything better. Our healthyish take on a classic treat. Almond flour, coconut sugar, vanilla, AND Lily’s Chocolate Chips. Gluten free stacked chips you feel good eating! Organic, raw, vegan, soy free, energy bars made in Austin, TX.